In light of the federal government shutdown that began Oct. 1, Columbia College will defer tuition charges for the term that begins Oct. 21 while military students seek other funding. For those who are affected and unable to secure other financial assistance, the college will offer a no-liability withdrawal policy or an extended six-month payment plan. "This is an opportunity to create some consistency and stability for our military students,” said Mike Lederle, assistant dean for military and federal programs. "Columbia College has been a leader in military education since 1973. We value the contributions of our service member students, and we want to continue to help them during this time of uncertainty." This is not the first time the college has taken a similar step. 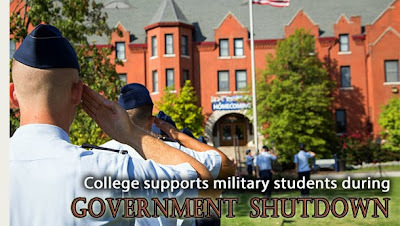 In March 2013, all branches of the U.S. Military ceased distribution of tuition assistance. During the 2012-13 academic year, more than 7,000 military students completed Columbia College coursework. Many of those affiliated with the military are enrolled at Columbia College's campuses across the country. Of those 35 locations, 18 are located on military bases, including one in Guantanamo Bay, Cuba. To read more about what Columbia College is doing to help students affected by the shutdown, read the Spotlight on the Columbia College website. Students with questions about the withdrawal policy or extended payment plan should contact their campus for details. For servicemembers and their families who are looking for more information on how the shutdown will affect them, visit this helpful website.